This card definitely has the right stats for competitive decks, but the symmetry – indeed, super-symmetry – of its comes-into-play effect will likely be a turn-off to some players. It shouldn’t be: it makes for a good political tool in multiplayer games, and since control or midrange decks usually get stronger as the game goes on, they won’t care about giving their opponent life if they can stabilize in the process. Aside from that, there’s also always the interaction with older cards like Kavu Predator and Tainted Remedy! A simple creature, but a solid one. 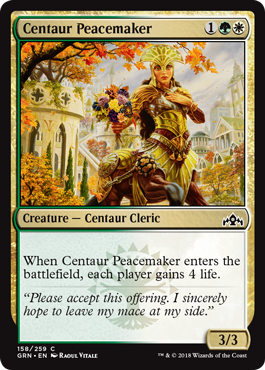 Centaur Peacemaker is slightly weaker than Selesnya has gotten in terms of sheer body size, but 4 life stapled to a 3/3 body is still a solid deal all-around. It’s a limited workhorse, but it lacks the efficiency to make a splash outside of smaller card pools.